Wow - I've seen coverage of that before, looks like a really good gig. Enjoy. Should I take it your's is the #66 bike and Tom is your son? [Edit: Uhh, just re-read Tom's bio. I don't think he could be your son, being born in '44] The Cannonball Run stops pretty close to my home and the route comes within 30 miles on September 13th. Will you be along all the way? If so, would that be driving a support vehicle or riding a more modern bike? Do you know of any objection or prohibition against "ride-behinders" going along for a few miles? As far as I know "support" riders are not allowed in the main body of riders? 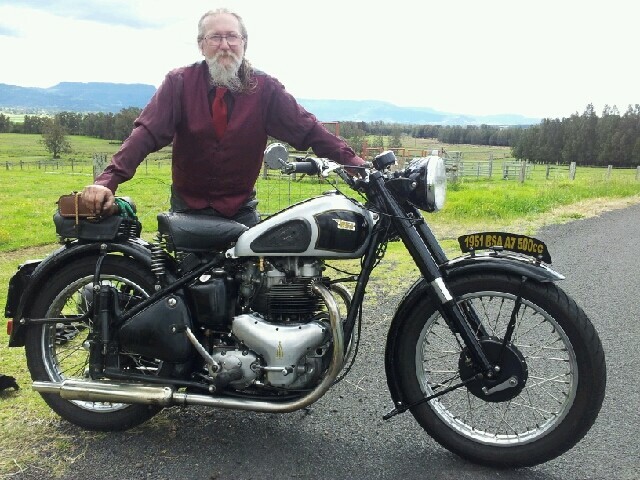 Good luck with it John- I'll try and keep tabs on it, last one was harder to follow as no definite team to target...first I saw it in 2012, I picked up a bug through the blog site I was on (I think it was the Buck Carson Sloper or maybe an Aussie with a BSA as well). A couple of friends calle round on their bikes and we headed off through Kinsale and its tourist traffic and on out to the "Old Head". Good one John. That 1st ride out after a rebuild is always a bit nerve racking. Looks good mate but is that front hub correct? I'd find it hard to ride a bike with no front brake. i only use the rear for emergency or trail braking in corners. I snapped the front cable going into stop corner at Amaroo racetrack. Threw her back another gear and went round speedway style. The saddle I was told is a "Police" option, ? Is it possible to tell if the motorcycle in this '20s photo with my dad and uncle is the same or similar model? I can see the tank cutouts and a similar headlamp.